We no longer carry the 94-04 MUSTANG RH INNER DOOR HANDLE. Check out 1994-2004 Mustang Interior Door Parts for an updated selection. The 94-04 Mustangs are getting to the age where Interior parts start to break from age and use. A perfect example is the inner door handles. LRS has a wide variety of Replacement interior parts to help with your Mustang Restoration. 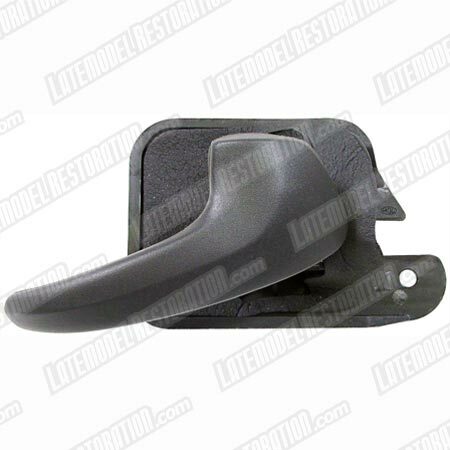 These 94-04 Mustang Interior Door handles replace your sprung or broken original handle and are simple to replace. Once you remove the door panel to gain access to them, remove a screw and slide it back from the door. Release the latch rod and it's loose. Putting it back together is just as simple.